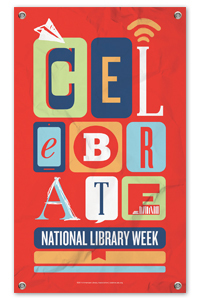 It’s National Library Week. Hooray! It’s also almost my anniversary of full time work in an academic library. In fact, my job interview to work at my first library took place during National Library Week. I tried very hard not to rely on that as a good omen. And then I got the job. And began working at a real live, actual academic library with students, at the end of last April. Even in my best daydreams, I could not have imagined the challenges and delights that awaited me. My Dispatches from #Librarylife are an attempt to capture some of them. Yes, I’ll be writing another installment, soon. (How great is that idea to help the community connect and start discussions! Yet another reason I love the Kansas City library. Public libraries have some terrific programs to help people who are homeless or struggling. San Francisco has been making news. Teens in Pawling, N.Y. used their library to coordinate volunteer efforts and give back. A library in a prison is making a difference. Libraries are providing resources for people with Alzheimer’s and their caregivers. I stumbled across a great program in Milwaukee and one in Effingham, IL. There’s a necktie lending program in Philly. I’ll be honest, this appeals to me for two reasons: it’s a smart resource for the community, especially job seekers. And also: neckties? That’s just a cool collection! I wonder how they’re cataloged. The theme for the Official Library Week this year is Libraries Transform. They certainly do. I’ve been honored to play whatever part I can in that.